STAND A CHANCE TO WIN AN EXCLUSIVE LIMITED EDITION FCB/DEFY BAR FRIDGE. Defy’s ethos, Believe in Better, reflects a desire to partner with users to improve wellbeing. This is demonstrated in Defy’s cooling, cooking and laundry product ranges centred on energy efficiency, eco-consciousness and sustainability. 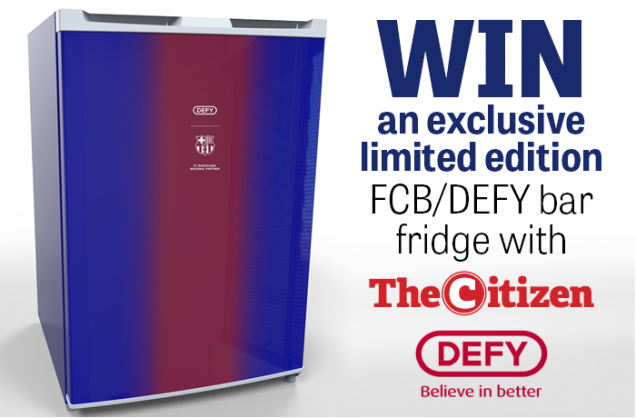 In a new partnership, one reader can win a branded FC Barcelona/Defy bar fridge valued at R5 000! The competition closes on Tuesday, 10 April 2018 at midnight.